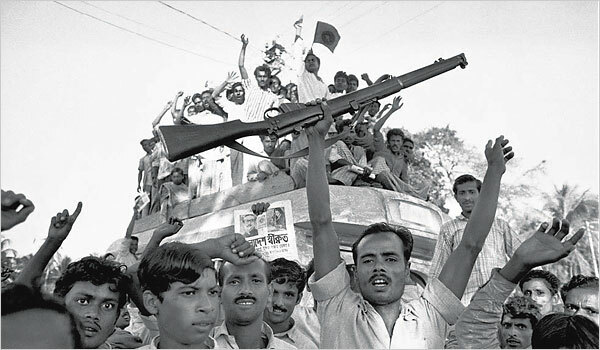 The glorious War for Liberation in Bangladesh turned powerful with the participation of people – the downtrodden, the exploited. They came from poverty-ruled rural areas; they came from machine shops chained to capital; they came from educational institutions – teachers and students primarily identifying with the aspiration of the exploited. To this huge human spirit, the bell of liberty was ringing the song of liberation from exploitative property relation. The communists, broadly identified as Left, were at the forefront in conveying this message of smashing down the exploitative property relation: A life liberated from all forms of exploitation as exploitation chains life, exploitation cripples and distorts life, exploitation stifles life. The masses of the exploited people in Bangladesh were always with these fighters in the Left camp engaged with a relentless fight in ideological and cultural, political, economic and organizational areas. Despite deviations and delusions, flaws and failures, the Bangladesh Left – fractured into factions – always upheld the banner of liberation. The camp followers, with a history of organizing people’s struggle in different parts of the country, always labored to organize the marginalized, the muzzled. The major part of the Left camp was always standing for an armed struggle. The effort gained momentum since March 25, 1971, the black day the Pakistan state unleashed its genocidal military campaign on the unarmed civilian population engrossed in its political fight in the form of a peaceful, non-cooperation movement. It was a major stroke by the state itself to make it wither away from this landmass. A few factions of the Left were preparing them in advance for such an encounter with the Pakistan state. However, these factions had to experience limitations originating from history and class that grounded many of their political and organizational moves. Nevertheless, they organized and carried on the fight since the earliest moments of this phase of Bangladesh people’s struggle for emancipation – encounter the state with armed form of struggle. Rifles and bullets replaced festoons and banners, protest marchers and demonstrators turned into guerrilla fighters, unarmed street barricades were left behind for making an ambush targeting the enemy. It was a transformation in struggle in form and organization – armed struggle as the main form of political fight, and, guerrilla units and armed organizations as the main form of organization. The form and organization spanned all over the country with variance in proportion, force and intensity. Sacrifices were very high, many of which are yet to be accounted. But, this saga mostly goes unreported, the bravery goes unsung, and the martyrs go unnamed. Haidar Akbar Khan Rano as editor has assembled writings – descriptions and analyses of politics and power of the Left in the glorious War for Liberation in 1971 – in his Mookteejooddhe Baampantheeraa, The Left in the Liberation War in Bangladesh (Tarafdar Prokashani, Dhaka, December 2018). The 480-page book of history and politics presents writings and interview from most of the factions of the Bangladesh Left, irrespective of shade of red and change of color at later stage. The 13 writings in the book are, among others, by Moni Sing, leader, now deceased, of the once-Moscow-leaning Communist Party of Bangladesh (CPB), Kazi Zafar Ahmed, once a fire brand Left student and labor leader turned prime minister under a military ruler, and Haidar Akbar Khan Rano, once a fire brand student and labor leader and now a presidium member of the CPB. It also includes writings by Manjurul Ahsan Khan and Mujahidul Islam Selim, former and present presidents of the CPB respectively, both of whom played a leading role in securing the CPB from liquidation during the Gorbachevite-wave in Bangladesh, Haidar Anwar Khan Juno, a student and cultural leader and one of the main organizers of a guerrilla force in an area that remained liberated all through the 9-months of the armed struggle. The volume includes a number of political documents also. “The problems of contemporary history”, writes R Palm Dutt, “raise in an especially sharp form all the problems of history in general.” (Problems of Contemporary History, “History and truth”, Lawrence and Wishart, London, 1963) Dutt, in the preface of the book, also raises the problem as he writes, “Contemporary history is a dangerous subject to handle. It is full of explosive material. Much essential information will not be known until many years later, as documents are released and memoirs published. Passions and partisanship can obscure objective judgement. Anyone who attempts to write contemporary history in any more durable form than a current journalistic article is laying his head on the block for the executioner.” Mookteejooddhe Baampantheeraa isn’t free from the problems Dutt mentions. The reality is impossible to escape. They fought heroically, organized liberated zones; and all these were done without any external help. More than a hundred martyrs are from the ranks of the communists and Lefts. But the bourgeois information/publicity media never refers to or mentions these acts and sacrifices. So, Haidar Akbar Khan Rano, with his own initiative, took up the responsibility of documenting this heroic chapter of struggle of the exploited of Bangladesh. A great job, no doubt. One may say, this is today’s fighters’ one way of admitting debt to the fallen comrades, and to the people. The book is a part of a people’s history. It tells struggles for the cause of the exploited. This book will be dug into for composing a people’s history in future. “If history is to be creative, to anticipate a possible future without denying the past, it should,” writes Howard Zinn, “I believe, emphasize new possibilities by disclosing those hidden episodes of the past when, even if in brief flashes, people showed their ability to resist, to join together, occasionally to win.” (A People’s History of the United States, Longman, London, 1980) Mookteejooddhe Baampantheeraa has done this – disclosing those hidden episodes of the past when […] people showed their ability to resist, to join together, occasionally to win – within its capacity. Limitations are difficult, almost impossible, to avoid. This book is no exception. There’s possibility that a researcher would question a number of facts presented in the book; but that doesn’t nullify the premise of and rest of the facts presented there, and that doesn’t deny the fact of millions of the poor’s participation in the glorious War for Liberation. This poor part of the society, the multitude, was the main strength of the War for Liberation. The book once again announces this fact. The book carries many such information by other leading Left leaders/theoreticians/fighters. The book presents six documents of a number of communist parties/factions/alliance. These documents, from 1968 to 1971, are related to the War for Liberation, and independence. In the book, reminiscences, three in total, remind readers of the brave people looking at the eyes of death while they joined the armed struggle. These tell the people’s courage, and their ever-ready heart to make supreme sacrifice for their best love – motherland, to all of us, Bangladesh, Aamaar sonaar Baanglaa, my golden Bengal. Awami League guerilla leader `Tiger’ Siddiqui’s public act of executing Maoists after the liberation war, in the name of branding them as `Pak collaborators,’ ?